Songs of Insurrection by J.C. Kang. Three Moons Press, 2017. Ebook. 484 pages. Songs of Insurrection is a beautiful Asian-inspired fantasy that brings together innovative ideas, a vast amount of culture, and great story-telling. I was consistently impressed by the worldbuilding and creativity in this start to a new epic fantasy series by J.C. Kang. Songs of Insurrection centers on Kaiya, a princess who doesn't particularly want to be a princess. Kaiya instead desires her to use her gift of singing to rediscover an ancient magic of dragon songs. Kaiya is a bold character who is rather stubborn and unwilling to fit into the place that has been created for her by her family. I found Kaiya's character engaging and somewhat relatable, though there were times when her actions just seemed a bit over the top and not entirely realistic given the strict society that she seems to be in. I also found myself feeling slightly annoyed by her continual focus on the romance and Prince Hardeep and I wish that she had focused on herself and her own goal just a bit more--or with a bit more determination for herself rather than for Hardeep. There are three different POVs used throughout this story, all of which have compelling stories to tell. In addition to Kaiya, we follow Tian and Jie, both well-written and detailed characters that each bring their own unique perspective to the story. I particularly enjoyed reading from Jie's POV--who also happens to be a half-elf-- and was impressed by the sheer detail of her experiences and how engaged I was in her entire story. There is also a heavy focus on specified roles in society among the characters and how both male and female characters are relegated to certain roles and unable to move away from the one that they are initially placed in. I was continuously interested to see how each of the characters handled this obstacle--even if they were unable to move away from them. This is one of the few fantasy books that I've read that used music in the magic system and I am a huge fan of it. Kang's magic system was so creative and really helps his novel stand apart from others. The world-building was also extremely detailed and well-done, but the only issue I had was the need to have quite so many names and titles mentioned that only seemed to serve to confuse me. An issue I also had with this book was that the pacing felt a bit off in certain places. The beginning felt slightly rushed with certain events and relationships that took place, and then a few places lagged here and there. Despite this, there are still many well-paced moments throughout the book that make up for the areas in which I was thrown off; however, I do wish that the entire book was well-paced so that I might have enjoyed it a bit more. 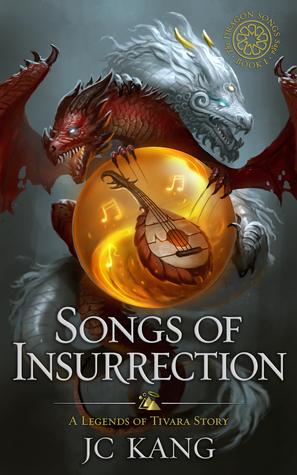 Overall, I've given Songs of Insurrection three-and-a-half stars! Kang has produced a strong debut that I would certainly recommend to any fan of epic fantasy with a music twist! You had me at Asian-inspired fantasy, though I'm sorry to hear that the pacing was off for you. But it's good that overall you still enjoyed it!